The usual breakfast. On the next table, Fenula is talking to the Tibetan owner lady, who is in mourning as her husband died three weeks ago. There are lots of photos of him on the wall, some detailing their escape from Tibet, others showing him with the Dalai Lama. They escaped Tibet when the Chinese invaded, i.e. at the same time as His Holiness. They travelled to Bhutan, then Nepal, then finally settled here, settling up over time three guest houses, two of which he gave to his brother, though they seem to have fallen out. Anyway, now the son is nominally running the place, so will it stay the same? Anyway, Sanrup, the very friendly Tibetan chap behind front desk, seems to be the person really running it. He has arranged for me to speak to his cousin about going trekking nearby. It’s officially low season with regard to trekking, so lots of the routes are off – animal mating season etc, but a German couple I spoke to here did a two-day one night thing near the Nepali border through Sanrup’s cousin, Sonam. It’s all done a bit quietly, as the owner lady doesn’t like this being arranged in the hotel, so we meet Sonam in the stairwell. He’s a small friendly chap, who explains about the trek, and quotes 2200 rupees each for us, inclusive of everything. The price seems a little expensive, but one never really knows the going rates for these things in advance. The price includes a porter, which I ask him to drop, which shaves 200 rupees per person off the price. Jeep transfer to and fro trailhead, two days trek, lodging and food all included. I decide not to haggle- I trust Sanrup and this is his cousin, so they are a Tibetan family who escaped in the 50s. So the trek will start two days later, something I suggest because I’m feeling a bit lazy, though I later realise that this is perfect, we’ll start on the Sunday, when most things will probably be shut anyway. A brisk walk down to post office with our tea. Pippi gets the best ones! In the post office a chap wraps up teas in linen, sealing with wax, for 20r per parcel, then we post them. 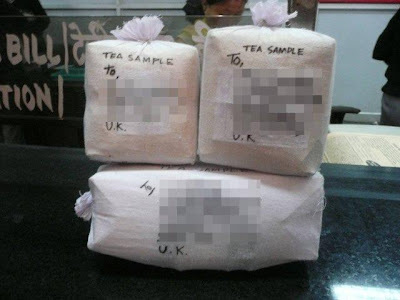 As they are “tea samples” we dodge the usual parcel customs formalities. Addresses blurred so as to not spoil any surprises! I hope they survive international post without being pinched – I’ve heard about chocolate boxes arriving empty here! I ask them where they get their sealing wax, as Supi wants some for her wedding invites. They tell me the market. I’ll go look later. Next up, the District Magistrates Office. The next state up from here is Sikkim, which borders China. Apparently China has never formally recognised India’s claim over the area, so India is a bit sensitive about visitors. I thought this was being over-paranoid till I read that China did try to invade an area near Assam in the 60s, as they officially reckon that anything that was ever part of Tibet is theirs, as it was all once part of the Mongol Empire! How ridiculous! I look forward to the UK taking back swathes of China, including Shanghai and Hong Kong, because they once “belonged” to us. Anyway, getting this permit is a beautiful example of the madness that is Indian officialdom. First you go to the District Magistrates Office, a walk out of town. The office you need isn’t marked and is buried in the complex, but as there is a small trickle of foreigners wandering in there looking confused, they will point you right. Upstairs, along the corridor, and there is an office which is dedicated apparently to Sikkim Permits. Three people working there. Hours – 11am till 1pm and 2:30pm till 4pm, Sat Sun closed. Don’t overdo it, boys. “We can’t issue permits for Myanmar passports here”, he says. “You’ll have to go to Delhi”. Three hours flight away! Why not, I ask? Because they’ve been told. Well do you have a list of which countries you can and cannot issue permits for, I ask? Yes, he says, but it’s secret, he can’t show it to me. How pathetic. Anyway, this is just the start of it. I proceed with my “application”. So, they stamp the piece of paper. I now have to take this to the Foreigner Registration Office the other side of town. This I do a few days later. Into the office, and another person takes the paper, opens his lined book, and copies out the information again. The same information as the other office. He then stamps the paper again with their stamp, saying that they have no objection to issuing the permit. Neither office checks my name against a computer database. They just copy the information that presumably they have already as I had to wait six days for my damn tourist visa, into their books. This done, you have to go back to the District Magistrates Office, where you get a stamp in your passport if they see you’ve got the two required approvals! What does all of this achieve exactly? It keeps several self-important officials in a nice easy job. I’m not sure about the Foreigner Registration Office, but the District Magistrate office keeps pathetic hours. What a life! Whilst we’re there, a boy brings them all tea. Later Sonam, our trek guide, tells us that civil service jobs are regarded as a “made for life” position. Anyway, next stop is the Happy Valley Tea Estate, just along the road. There’s an advert by the roadside, then an unmade road winds down the steep hill which is lined with tea bushes. It’s beautiful. There are several men with surveying equipment busy doing something. I ask the boss if they are planning to tarmac or remake the road. Oh no, he says, we’re going to build a car park here! No way! The picking girls are near us now, and they are all busy plucking away, dropping what they pick into the baskets on their back, held in place with a band across their heads. I am reminded of my sore neck after trying a little girl’s basket of firewood in Nepal. Anyway, they all chat and gossip away amongst themselves, and seem happy. I later learn that they are paid 48 rupees a day for eight hours work in the fields – that’s about 60p. They smile and wave at us, so Thuzar goes out to join them. At the bottom of the road there is a small café, with an old woman sitting outside enjoying a cup of tea. She invites us in. We’re not sure whether this is something official, and hesitate. No charge she says, before going on to explain that the factory just below us is not closed, but there’s nothing going on now. If we’d like, we can have tea in the café and she’ll explain all about tea and the Happy Valley Estate. This being India, I’m highly suspicious of a scam, but she seems friendly and speaks well. We go for a wander around the tea first. The woman is in fact Nepali, but moved to India when young, and has lived in Darjeeling for donkeys years. She says she’s 67, and looks good for this age, which she attributes to the Happy Valley tea. Her living room, or the café, is the most kitsch thing I’ve seen since those shimmering waterfall clocks you get in Vietnam, or perhaps the multicolour led displays behind the Buddhas in Burma. She has fluffy dogs, candles, rugs with all sorts of patterns, lace, and plastic plants. Her daughter-in-law potters about in the kitchen whilst she shows us different teas, asks us which we think is which, and then proudly talks about Happy Valley’s Super Fine Tippy Golden Flowery Orange Pick 1 (pekoe? Is this what pekoe comes from or is she talking rubbish?). We end up feeling obliged to buy some tea from her, though after we’ve been there for two hours, I don’t feel like it’s a scam any more – she just genuinely likes talking to people! She does seem to get on well with the picking girls, which I take as a good sign. When four o’clock rolls round some of them pop their heads round her door and say hello. As we leave, she tells us that there is a Nepali cultural show on at Nightingale Park, which is up above us now, so we walk ever so slowly up the hill, out of the tea plantations, through a graveyard containing mostly British graves from early in the twentieth century, including General Lloyd who discovered Darjeeling and died here in 1865 aged 76, past the Hot Stimulating Café (ah ha, that’s where it is, we’ll be back here later for momos! ), and pay the foreigner entry price for the park. It’s a nice small ornamental park perched right at the top of the ridge, and would probably have fine views if it weren’t so cloudy. The show starts late, or on IST (Indian Slack Time), and consists of half a dozen girls and boys demonstrating different styles of dance from Nepal in front of the “Bullet Proof Dais” (as it is labelled in bright pink lettering). There are very few people watching – apparently she show is on every day but is poorly advertised in town – we only found out about it because of the lady in the Happy Valley. It’s nice, but in between each dance they seem to stop for about twenty minutes, so after two dances we’ve had enough of sitting around, and head back to the hotel. Interestingly Darjeeling itself is mostly Nepali – about 60% apparently – hence there has been some political trouble in the past, even resulting in assassinations in 2001, with a group called the Darjeeling Gorkha Autonomous Hill Council now apparently running the show. Originally the area belonged to Sikkim Kings, who lost the area to invading Gurkhas from Nepal. Their aggression lead to several battles with the British, and so eventually the East India Company took control of the region in 1816, and ceded the lands back to Sikkim. The Kings later leased the uninhabited land to the British in 1835, and the hill station of Darjeeling was born. Walking back the town seems ghostly in the thick mist which seems often to shroud the ridge. Thuzar “namastes” (Himalayan hello) to people we pass – and it’s endearing to see older people, their arms full of goods bought in town, actually look frustrated because they can’t clap their hands together and namaste back. At the hotel, we receive our laundry bill – a rather expensive 180 rupees for not much washing – they’ve priced it on a per-item basis. The girl who brings it is just a child, so I give her 200 and tell her to be on her way. We then head to reception to meet Fenula, who has a similar laundry bill and is clearly more upset than us about it! The price and the fact that everything is damp, and she’s flying the following morning. Trouble is up here, with all this mist swirling about the air is damp, I don’t think there is any way of getting anything dry short of draping it over a boiler. Another chap, Hiroshi from Japan, joins us. He’s started his own tea shop in Japan, and is here buying and visiting tea estates. On the way out, Fenula shows us Mandalas, the Buddhist pictures representing, well as far as I can gather, the whole world and everything in it, which go for rather princely sums. There’s a debate raging here about whether they are genuine, given that Buddhists are never to sell such items (straight to hell), plus would original ones from Tibet have survived all this time? Probably not. Fenula’s choice for her last night is Glenarys, which we have no issue with. As usual, way too much delicious food, washed down by Dansberg beer from Sikkim. When the restaurant shuts at 9:30pm, we wander down to the bar underneath for another beer (though it’s last orders in the bar a few minutes later too). Hiroshi by this time has had too much, and the place is full of sleazy guys who suggest driving to Tiger Hill now? For what? This is the place with the sunrise view if it’s clear. Certainly wouldn’t want to be in a car with any of these guys on mountain roads, as they’re all drinking too. Safe Tea First! The place closes at 10pm, probably the last place open in town! We know it’s time to go, as the water has been cut off in the bathrooms! We’ve been shielded from the highly unreliable water supply in our hotel because they have big tanks, but the supply here is terrible – it was built by the British a hundred years ago or so, when the population was not a quarter of what it is today. And as is the Indian way, not a rupee has been spent on it since Independence! Apparently there are various plans to upgrade it, but the money always gets lost between contractor and subcontractor, and nothing ever gets delivered. We walk Hiroshi home, then meet a couple of Spanish guys lost in the dark – they know their hostel is up a hill somewhere, but without sun or street light, or a soul on the roads apart from us, how to find it? !